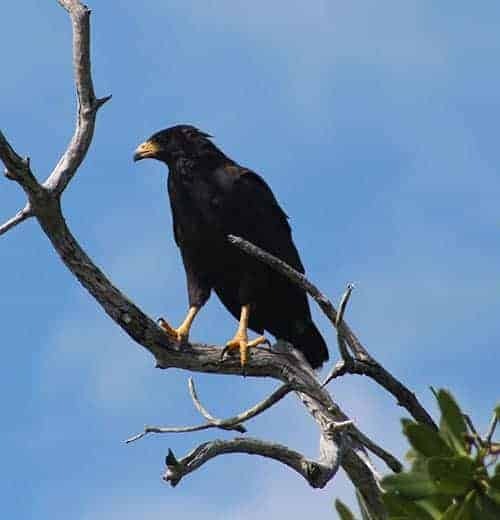 Discover the highlights of the Yucatan with this adventure and culture filled trip to Ek Balam and the Rio Lagartos Biosphere. We first visit the ancient mayan site of Ek Balam or site of the “Black Jaguar” This is a site from the classic period were you will marvel with the tomb entrance built for the ancient king and climb the different temples all accompanied by our top notch archaeological guides . 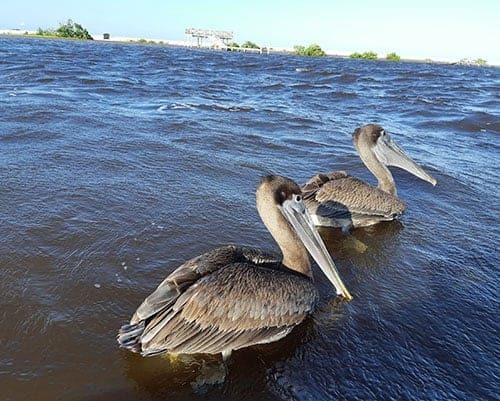 from there we continue to Rio Lagartos Biosphere to catch a boat and see the diverse species of birds like Herons, fishing Eagle, pelicans and of course the flamingos. 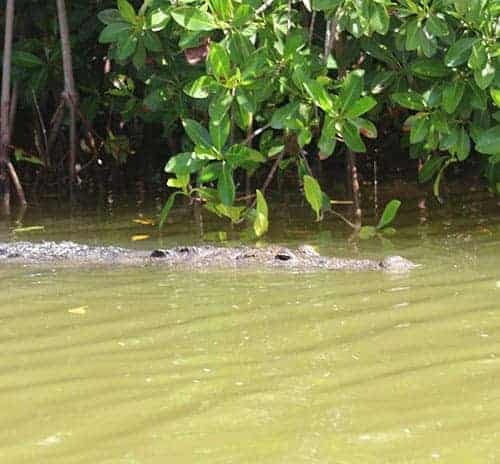 Also along the way we may see other inhabitants of the coastal ecosystem within the mangrove forests such as the mighty crocodiles and Raccoons. 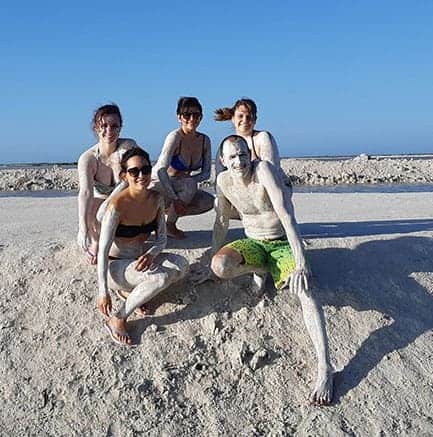 We arrive at the world famous Coloradas or “magenta waters” these are pink lakes that cover the landscape and contrast beautifully with the blue skies. 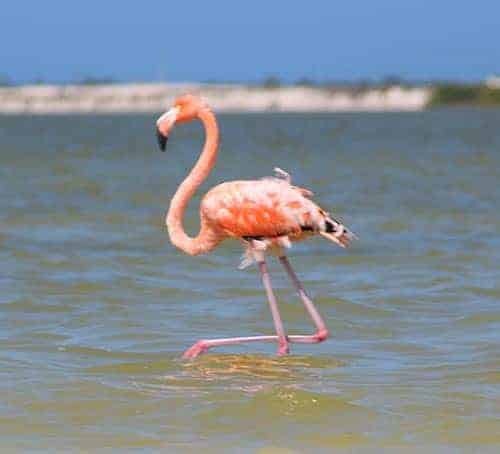 The amazing pink color of these lakes is due to red-colored algae, plankton, and brine shrimp that thrive in the salty environment and the flamingos are pink because they eat these pink shrimp. This is all part of the protected wetlands areas. This was used by the Mayas for the production of precious salt and is till today a salt mine. In this area we take a Mayan mud bath . After that we return towards the Sea to a private beach to rinse of the mud and enjoy the waters. After this we return to lunch at the Ria Lagartos restaurant for a great seafood meal. After this, we return to the hotels. DEPARTURE TIME Between 7:00AM- 7:30 AM for a prompt departure. WEAR Comfortable athletic clothing, tennis shoes, hat, sunscreen (biodegradable) and insect repellant (biodegradable). All entrance fees, Bicycles (when applicable). Bestmayatours Professional Guided visit of Muyil. We recommend that you bring comfortable clothes and shoes (flipflops, sandals ok, ), bathing suit, sun glasses, towel, camera, binoculars, sun protection (biodegradable, or clothes to aid with sun protection), some cash. Please note that there are no ATM machines in the area, nor do any of the vendors accept credit cards. The guides, drivers and waitress appreciate tips for their excellent service. Its also thanks to them that you will leave with many great memories! Explanations about the Rio Lagartos Biosphere. Talk about Maya classic Period, Navigation . Sight see and photography of birds and animals different native species of flora and fauna. 2:30 PM – 3.30 PM: Lunch. Different options of seafood fish, shrimp, Octopus.